It's impossible to review a show by the Revolution and not mention Prince Rogers Nelson. The original, unnamed incarnation of the band was formed in the early '80s as Prince's backup band in a style reminiscent of Sly Stone's mixed-race/mixed-gender ensemble, coalescing into the Revolution as we know it for the 1984 release of Purple Rain, one of the most important music artefacts ever crafted. The band continued to evolve over a few short years before being dissolved in 1986, last appearing together on "Adore" from Sign o' the Times. Thirty years later, Prince shuffled off this mortal coil without warning, leaving legions grieving in their own way. That's where it gets a little tricky. 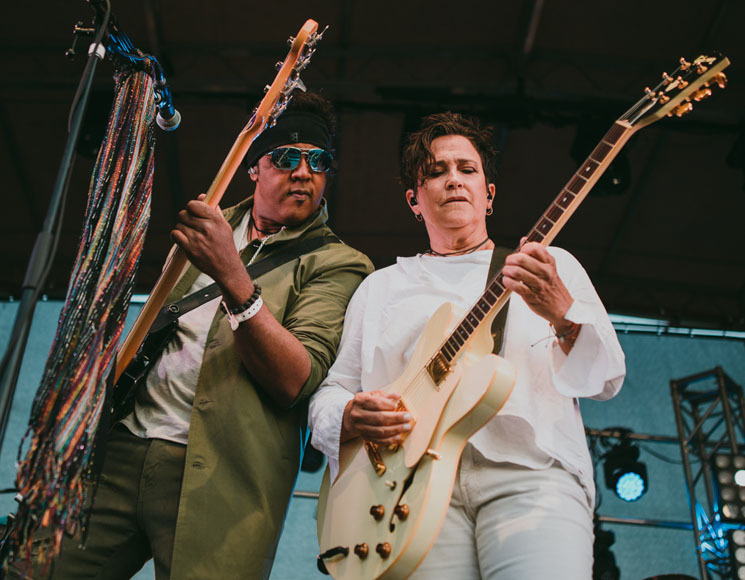 Guitarist/vocalist Wendy Melvoin, bassist Brown Mark, keyboardists Matt "Doctor" Fink and Lisa Coleman, and drummer Bobby Z. immediately got back together following Prince's demise and headed out to play the songs that made them famous for three shows at the First Avenue nightclub, where the Purple Rain film was shot. To hear them say it, it was all about giving everyone a place to express and exorcize the weight of the immense loss of their fallen hero, but since the response was so overwhelmingly positive, they decided to keep it rolling, and they've been on the road ever since. Since it's a band performing iconic music without its frontman, with Brown Mark taking over most of the lead vocals, it does feel like it's at least a tiny bit on the exploitative side, in a similar way to the Doors of the 21st Century or Creedence Clearwater Revisited. However, unlike those two examples, the Revolution have a lot more going for than against them. It helped that the band are the complete, original Purple Rain lineup, and that they happen to be as incredibly skilful now as they were then. Melvoin has that commanding Tina Turner/Janet Jackson '80s pop gospel diva thing going vocally, and she's one hell of a guitarist. Wearing the surgical scrubs suitable for his nickname, Dr. Fink brought the theatrics on keys, especially prominent given the canon of Chromeo-worshipped synth-funk from which they were drawing. Brown Mark put on one of the most impressive bass displays I've seen this side of Thundercat and Tony Levin (King Crimson). Their set list was timed out well too, seemingly building momentum as it progressed. It all came together on "Let's Go Crazy," which was right in Mark's vocal range, and he rode it nicely, while Melvoin put in an incredible effort in replicating Prince's scintillating guitar work. Furthermore, they brought out Grammy-winning neo-soul singer Van Hunt to do the heavy lifting on falsetto whenever needed, and he filled those big shoes admirably, particularly on the well-received rendition of "Kiss." So, while the spirit of Prince remained heavy, the Revolution lifted it up high enough to push through to an honest expression of love and honoured remembrance. In fact, Victoria gave them such an enthusiastic response that they didn't want to leave Canada. At one point, Melvoin asked if anyone in the crowd would marry her, so she could get dual citizenship. Unsurprisingly, there were many takers.